Some thousand years ago when communications were poor and central government weak or often non-existant villages were ruled by the Lord of the Manor and, as time progressed, Parish Priests and School Masters became involved in matters relating to the whole community as they were the only adult inhabitants with any form of education. Around 1600 the church took on a more active role in the government of the community and Church Vestry Meetings were organised and introduced legislation to give themselves the responsibility of levying the poor rate. These were the first effective local taxes. Everyone in the parish was entitled to attend Church Vestry Meetings but in reality the work fell to a few individuals, rather like the Parish Councils of today. In the 1800's the Poor Law Amendment Act removed from Parish Vestries the responsibility for poor relief and handed it to the Poor Law Unions who were the predecessors of what is now our District Councils. Although the Squire, the Parson and sometimes the Schoolmaster were still the leaders in the village, popular education was spreading and more people wanted a say in managing local affairs and it was W.E. Gladstone, then Prime Minister, who introduced the 1894 Local Government Act which, although faced with considerable opposition, made its way through the Houses Of Parliament to became law and result in the formation of Parish Councils as we know them today. The history of Parish Councils can be read in the right-hand column where it can be seen that although Parish Council's originated from the church legislation in 1894 resulted in the Parish Council being responsible for civil matters whilst church affairs became the responsibility of the Parochial Church Council. 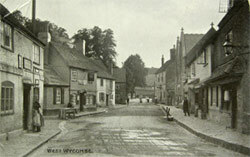 In 1986 Col. Lesslie Watson, a resident of West Wycombe for forty years, thought it would be a good idea if West Wycombe had its own Parish Council. It seems that there had been Parish Council here some 55 years previously. We're unsure of how it fell by the wayside, but two villages on either side of West Wycombe, Downley and Piddington, took the name, West Wycombe Parish Council, but it did not include West Wycombe! Col. Watson organised a referendum and even though there was a low turn out to vote, it was clear that the residents wanted their own Parish Council to look after the interests of the area. Once National Government ensured we filled all the criteria he applied to Wycombe District Council to get the name returned. Downley became a parish council in its own right, and Piddington joined with Wheeler End to form a parish council. Col. Watson encouraged people to stand for the parish council by inviting them to tea. The first election was on 7th of May 1987. 12 people stood for 7 positions as Councillors, 4 women and 8 men. Originally 13 but one man stood down at the last minute. It was very exciting at the “count” in High Wycombe Town Hall. The highest vote was 279 and the lowest 114. The first councillors were, in order of votes, Vicki (June) Bristow, Christine Baul, Michael Gerrard, John Turner, Jayne Watson, Lesslie Watson, and Gordon Sparrow. The Parish Councillors were summoned to their first meeting by Wycombe District Council, which was held in the Church Room at 6-30 pm on Tuesday, May the 12th 1987, and invited to elect their Chairman (Lesslie Watson) and Vice-Chairman (Vicki Bristow). Vicki Smith (formerly Bristow) became Chairman two years later, and is the longest serving member of the Council. Michael Gerrard retired for a short time but was re-elected and held office until he died on 30th June 2005. The first Parish Clerk was Mrs Dee Cameron who held the post from May 1987 to June 1988 when she was succeeded by Mrs Gill Aldridge who carried out the duties until November 1995 when our present clerk Mrs Sharon Henson took over the position and gained her AQA Accreditation in Local Council Administration on September 29th 2004; a pre-requisite qualification for any Parish Council seeking quality status. Today the Parish consists of approximately 1000 adults plus children and the National Trust owns most of the properties in the village. The remainder of the Parish is made up of privately owned flats and houses. A large number of the residents have lived in the Parish for many years. We have a village school, a playgroup, a library, a village hall, a small meeting room owned by the church, a Post Office, local general store, a butchers, a newsagents, a furniture shop, three public houses, three churches (4 religious denominations), a civil burial ground, a furniture restoration company, two garages selling cars and petrol, an architects office, an accountant's and three other office based companies. West Wycombe is of course famous for the "Hell-Fire Caves" and the Mausoleum owned by Sir Edward Dashwood, who also runs corporate events in the Park and sells fishing and shooting rights. The farmland is now rented out to separate farmers. There are many active groups in the Parish which can be located in our 'Directories' section and in addition there is a committee of local people who organise outings and social events for the senior citizens. The residents and the Parish Council have identified many issues that need to be addressed and consultation is ongoing. The Parish Plan Questionairre was circulated in 2011 and again in 2013 to all residents (adults and children), users, and shortly to businesses in the community, in an attempt to ensure quality of life continues to improve and that we use our best endeavours to protect the Parish and our environment. More details on the history of the village itself can be found on the Community History page.